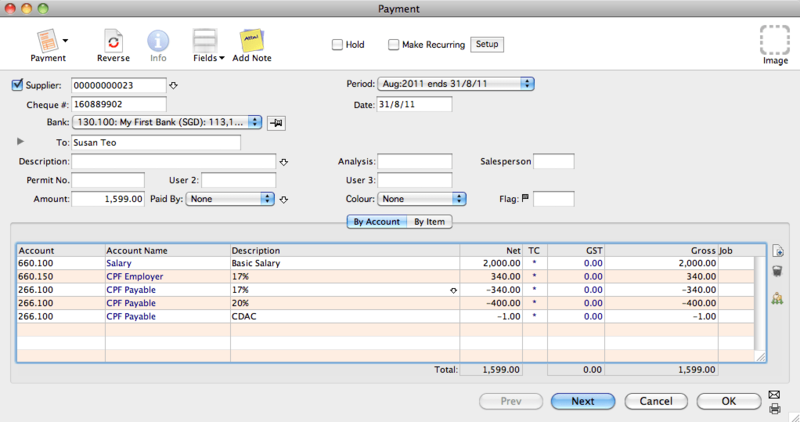 The MoneyWorks accounting software doesn’t have a Payroll module built in. To record the Salary payment to your staff you may consider using the Payment transaction. Assuming you have an employee with a salary of $2,000.00, the CPF employee is at 20% and CPF employer is at 17%. On top of that a CDAC fund of $1.00 need to be deducted from the employee salary. In the above example, there are two payment need to be made. One is paid to the employee and the other to CPF Board. The net payable to staff will be: $1,599.00 and this amount will be deducted from the Bank account. This entry was posted in Accounting, MoneyWorks, MoneyWorks v6 and tagged accounting software, mac accounting software, Payroll, Singapore, Small Business Accounting Software, software. Bookmark the permalink. Debit CPF Employer expense account $340.00 (instead of CPF Employee)? Yep. Is a typo error. Thanks.